Each question below contains a statement followed by Quantity I and Quantity II. Find the relationship among them and mark your answer accordingly. 1. Quantity I: Marked price of an article, which is purchased for Rs. 650 and the shopkeeper allowed a discount of 20% on the article while the profit earned on the article is Rs. 62? Quantity II: Selling price of an article, which is marked at Rs. 1250 in which shopkeeper allows two successive discounts of 10% and 15%? 2. There are 240 students in a class whose average age is 18 years. The average age of the boys in the class is 20 years while the average age of the girls is 14 years. Quantity I: No of boys in the class is? Quantity II: No of girls in the class is? 4. A sum of Rs. 2385 was divided among A, B and C in such a way that the amount received by A is 20% more that of C and the amount received by C is 25% less than the amount received by B. Quantity I: Amount received by A. Quantity II: Amount received by B. 5. 12 boys and 16 girls can do a piece of work in 34 days, while 10 boys and 14 girls can do the same piece of work in 40 days. Quantity I: In how many days 20 boys and 14 girls will complete the work? Quantity II: In how many10 boys and 25 girls will complete the work? 6. Quantity I: The profit earned by selling an article for Rs. 210 is 20% while the discount percentage allowed on the article is at the rate of 30% then find the percentage by which markup price of the article is raised above cost price? Quantity II: What is the profit percentage earned by selling an article which costs Rs. 180 and the shopkeeper sold the article for Rs.320? 7. Quantity I: The average age of five members in a family six years ago was 35 years while the present average age of 6 member is 39 years, daughter-in- law being the new member, then find the age of the daughter-in –law? 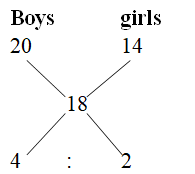 Quantity II: The ratio of ages of A and B at present is 2:3. Five years hence, their ages will be in the ratio 5 : 7 then find the present age of A? 8. Quantity I: Simple Interest earned on a certain sum of money after 4 years is Rs. 2240 at the rate of 5% then find the principal? Quantity II: Money invested by Rohan is Rs. x while the money invested by Sohan is (x - 4000) while the total the total interest received by Rohan and Mohan is Rs. 4800 at a simple interest rate of 4% after 6 years then find the value of x? 9. Quantity I: A, B and C can complete a work in 6 days while A and B can the same work working alone in 20 and 35 days then find in how many days C can complete the work by working alone with ¾ of his original efficiency? Quantity II: 15 men can complete in 20 days or 18 women can complete the same work in 24 days then find in how many days 10 men and 14 women can complete the same work? 10. Quantity I: 180 m long train crosses an electric pole in 12 seconds then find the time taken by the same train to crosses a platform of length 230m? Quantity II: Another train of length 120m crosses a man walking at a speed of 4 km/hr in the opposite direction of the train in 10 seconds then find the time taken by the train to cross a bridge of length 140m? Directions (Q. 1-5) Each question below contains a statement followed by Quantity I and Quantity II. Find the relationship among them and mark your answer accordingly. Quantity I: Marked price of an article, which is purchased for Rs. 650 and the shopkeeper allowed a discount of 20% on the article while the profit earned on the article is Rs. 62? Quantity II: Selling price of an article, which is marked at Rs. 1250 in which shopkeeper allows two successive discounts of 10% and 15%? There are 240 students in a class whose average age is 18 years. The average age of the boys in the class is 20 years while the average age of the girls is 14 years. Quantity I: No of boys in the class is? Quantity II: No of girls in the class is? A sum of Rs. 2385 was divided among A, B and C in such a way that the amount received by A is 20% more that of C and the amount received by C is 25% less than the amount received by B. Quantity I: Amount received by A. Quantity II: Amount received by B. 12 boys and 16 girls can do a piece of work in 34 days, while 10 boys and 14 girls can do the same piece of work in 40 days. Quantity I: In how many days 20 boys and 14 girls will complete the work? Quantity II: In how many10 boys and 25 girls will complete the work? Quantity I: The profit earned by selling an article for Rs. 210 is 20% while the discount percentage allowed on the article is at the rate of 30% then find the percentage by which markup price of the article is raised above cost price? Quantity II: What is the profit percentage earned by selling an article which costs Rs. 180 and the shopkeeper sold the article for Rs.320? Quantity I: The average age of five members in a family six years ago was 35 years while the present average age of 6 member is 39 years, daughter-in- law being the new member, then find the age of the daughter-in –law? 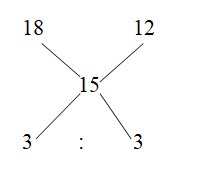 Quantity II: The ratio of ages of A and B at present is 2:3. Five years hence, their ages will be in the ratio 5 : 7 then find the present age of A? Quantity I: Simple Interest earned on a certain sum of money after 4 years is Rs. 2240 at the rate of 5% then find the principal? Quantity II: Money invested by Rohan is Rs. x while the money invested by Sohan is (x – 4000) while the total the total interest received by Rohan and Mohan is Rs. 4800 at a simple interest rate of 4% after 6 years then find the value of x? Quantity I: A, B and C can complete a work in 6 days while A and B can the same work working alone in 20 and 35 days then find in how many days C can complete the work by working alone with ¾ of his original efficiency? Quantity II: 15 men can complete in 20 days or 18 women can complete the same work in 24 days then find in how many days 10 men and 14 women can complete the same work? Quantity I: 180 m long train crosses an electric pole in 12 seconds then find the time taken by the same train to crosses a platform of length 230m? Quantity II: Another train of length 120m crosses a man walking at a speed of 4 km/hr in the opposite direction of the train in 10 seconds then find the time taken by the train to cross a bridge of length 140m?